If you have a happy ending share your happiness with others to give them hope. Just send us an email to: info@connecticutcatslostandfoundorg and we gladly publish your success story. 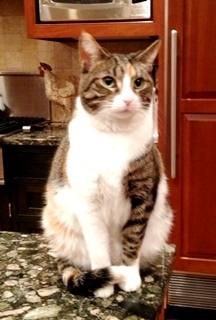 This cat was reported as missing the the following ad was placed on our website"Lost cat in Darien as of November 15,2013. Two year old neutered male, "Jiffy". Any information please call owner Rosemary..." On Nov. 20,2013, we received the following email: "Our cat came home last night safe and sound! Thx for all: your help. Rosemary "
This cat was lost and this ad was placed on our website”Male cat “Emmet”lost in Wolcott at Laurel Lane on 10/14/2013. He is 2 yrs old, dark grey w/ some black lines,face like a tiger …on October 24, 2013, we received the following wonderful news: " Its a miracle he just came home ! Its 8:00 and I called for him tonight and he was across our street and came home.It took some coaxing and I fed him and boy oh boy did he eat! So happy he is home and you were right the whole time ,never give up hope!! !Happy Endings do come true and now I can finally sleep tonight!Thks !! !You can remove him from the lost section.I hope some of the other petowners find their cats also,never give up hope even after 10 days.Sincerely you gave me hope thks again and again...Tammy"
This female tabby cat was reported as missing on April 18, 2013 from West Hartford, CT and ad was placed on On April 21st, we received the wonderful message: "I am happy to report that we did find Michalina near home, as you thought we might, late last night. Thank you very much for your suggestions.Laurie"
Orand and white skinny cat named Trouble went missing on Jan. 5, 2013 in West Hartford and was wearing a leopard collar. |An ad was placed on our website. 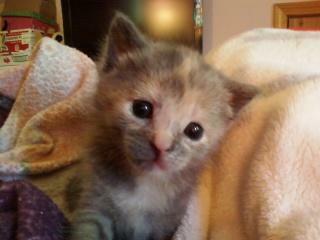 On April 18, 2013 we heard from the owner that her cat had been found after months of being gone. She wrote: "Becky" at Hidden Treasures Adoption Center used clues from Trouble's collar to find us!!! I can't express how much it means to Grace and I to have our baby back--we just got home with him today. As each day passed from january 5 I lost a littble bit more hope of finding trouble alive..." Thank You! Thank You! Thank You! In December of 2012, we posted the following ad for this cat" Cat lost from Greenfield Dr.,Shelton on 12/19/2012...On April 16, 2013, we received the following. Hi after 3.5 months, our cat has returned on his own. Thank you for posting for us." 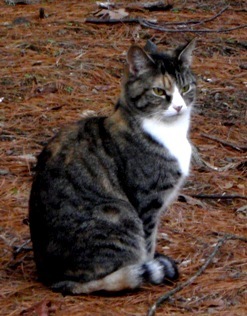 April 2013, the following ad was published for this kitty: " On March 30, 2013, we lost our striped calico cat named Tilly...On April 11, 2013, we received the following good news. " I found my cat Tilly!! She was about 1/2 mile away under a neighbors outbuilding. ...We are so happt to have her home and she seems very glad to be back settling into our new hours. Thank youfor all your concern and help! 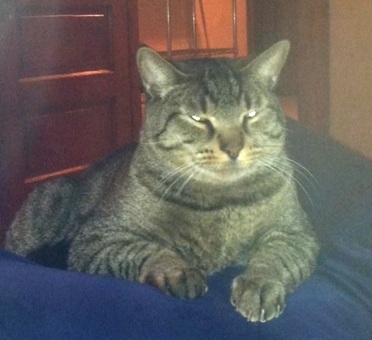 Mimi"
This Tabby cat was reported to us as missing from Wolcott on 11/19/2012. His owner described him as yellow/goldish and white, answers to Mater.' An ad on our website was subsequently posted. 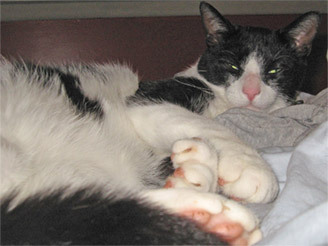 A week later we received the happy news: " Hello, I would like to thank you for your help with our cat Mater. I would also like to let you know that we found him locked in a barn only 300 yards from home. He was there for 6 nights. He is home and doing well. A little thinner and sleeping alot. Thanks again Paul "
This lovely kitty was reported to us as a cat found in Canton, CT and this ad was placed " There has been a young (probably less than 1 year old) cat hanging out in our yard and our neighbor’s yard on East Hill Road in Canton for the past 2 weeks from 10/27/2012 to ﻿11/17/2012...: On November 24, 2012 ,we received this wonderful news: "We are happy to report that the owner of this kitty, a neighbor, called us to let us know that this was their newly adopted cat who just seemed to like our yard better than hers! All is well. 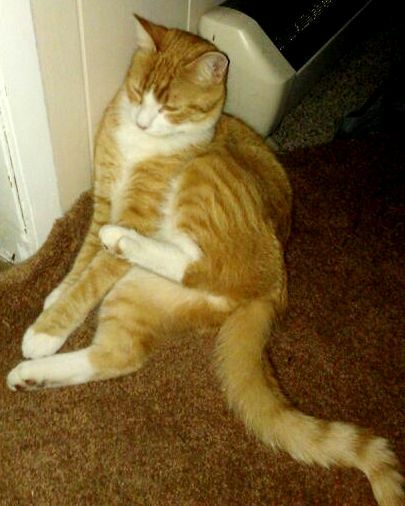 ..Thanks so much for posting.Jan & Bob"
We placed this ad on our website : "My cat,Dobby,missing since 10/14/2012. Last seen near Morningside Drive East & Stafford Ave in Bristol. ..."On October 19,2012, we were notified via email of the happy ending: "Thank you so much for your support. Dobby did finally come home, praise the Lord! I really appreciate the help and the information. Sincerely, Tracy"
Thank you and God bless.﻿"
We posted an ad for this cat: "Female indoor cat named Scruffy lost from Bethpage Dr.,Bethel,CT since 10/07/2012.She is gray w/white & yellow markings..." A few days later on October 11, 2012, we received this joyful email: "When I went home, Scruffy was not back yet. My son said he was calling her all day….and nothing. Scruffy always would hit me with her paw when I cried or yelled. It was her way of saying…hey! Stop that! Or It will be okay!....well, I went out to the yard calling her for 45 minutes…then I got myself so worked up …I started crying…and I went back outside calling, “Scuff”, sob sob, Scruff, sob sob……………but no Scruff. All of a sudden it looked like such a big world for Scruff to be alone in without me…..and I went into the kitchen and cried like a baby. All my other animals looked on in concern and as I cried and spoke to them, I looked out the glass door and there she was … sitting patiently and looking up at me…like … whats wrong mommy? I have my Scruff Bucket back…..Thank you for your service, God Bless+ ﻿"
This cat was reported as missing by her owner " Female cat named Laila, 1 yr. old , indoor (born as Ferrell cat) missing since first week of Sept. 2012 from Hull St.in Bristol.' On September 24,2012 we received the following email: "Thank you for your email and effort in putting this information up on your website. so happy to say that she came home last night. She was in my neighbors yard. We found her! 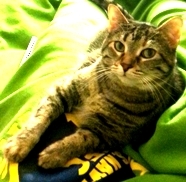 I really thought she was gone for good ﻿Thank you again for your help.﻿Rhea"
In June we received the following" Cat Wilson lost in New Britain, Connecticut, last seen on Burritt Street on June 8th, 2012,contact Tom...Three days later Tom wrote and have the following happy news story:. "Thanks for posting my ad, but my cat has been found 2 days later. He's never been outside before, and I had put out some salmon in a bush near my house and I found him eating it at 1 am. He's never scratched me before, or even raised a paw (he's a little coward), but he tore my hand and arm up so bad it still hurts when I grabbed, him, but I held on to him for dear life and go him back inside. He also bit my knuckle so hard it's swollen to twice it's normal size. If that ever happens again, I need to be sure to have a towel with me when I go to get him. But now he's back to his normal, loving self. He was just really scared. When he came inside he hid under the bed for 2 hours and then came out to drink water, and must have been licking at his water dish for 2 hours straight (not exaggerating at all). I bought him a brand new collar with his name and my phone number, and I think everyone should have one for their cat. Thanks again for your service. 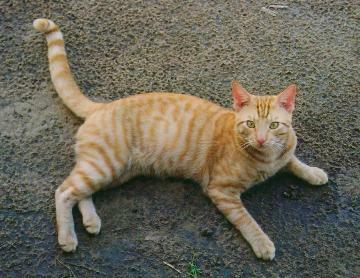 Tom"
﻿ On June 5, 2012, we posted an ad for this orange female short haired tabby cat which was found in New Milford.A few days later we received the following good news email: "Thanks for your help, the signs in our neighborhood worked and "Oliver" is now back home with its family - 2 blocks away. 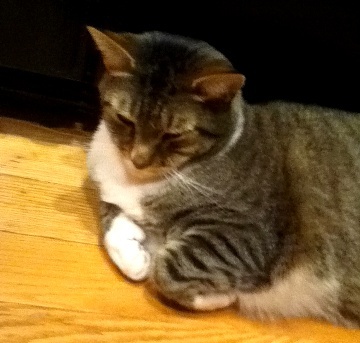 Thanks again, Carey"
﻿﻿Cat recovered in Derby, CT. We listed the following ad: "My female 10yr old tri-color brown marble bengal cat, with light yellow/green eyes has been missing since May 30th 2012﻿,,,,:she responds to Chloe"...Nancy. Couple of weeks later we received the following good news email: "I am elated to inform you that Chloe my 10yr old bengal cat has returned! It is so true that they are most likely very close by. My neighbor saw her come to my yard this morning! She was gone when i answered neighbors knocking, but then came right back and waltzed into the house! It is a miracle! She is fine! Not a flea or mark on her! After 11 days she feels a little bit lighter. Thank you so much for putting her on your list. As promised, I wanted to let you know if she was found. Thank you so much for your help. Sincerely, Nancy & Chloe ﻿"
On May 13, 2012, we received the following email: “this is Tira she got lost yesterday; saturday evening. 4,5 yrs old. mainecoon. calico. shy and fast and small. About a week later on May 22, we received the following good news: I have just found my missing cat! She was trapped in one of the neighbor's garage. well, I did put up a note and asked everyone to check their garage but that lady is really old and she doesn't answer her door and she doesn't talk to people Luckily there was a little gap under the garage door and we were able to lure Tira out! Thank you for everything. “Hi – I am writing to let you know that my cat Versace had gotten out of my house (she is indoor only cat) on April 4th,2012 sometime at night. 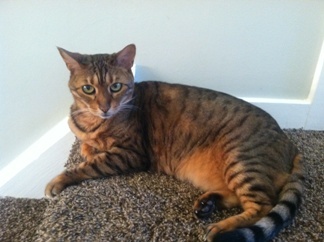 She is a 13 year old Bengal … She was last seen at Ledgebrook Lane in Middletown. ” Only a few days later we received the happy news: ‘Thank you for your help!!! Three days later I found her under a deck scared with another cat. I saw her out of the corner of my eye like four houses down. She is home and starving. Brian"
This kitten recovered after being gone for a week. 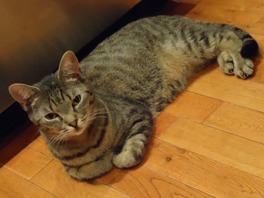 The owners of this kitten placed the following ad with us: "Male kitten, 1 yr old ,yellow tiger striped lost in area of Chimney Heights, Bethel,CT on 3/23/2012. Indoor only cat." ﻿On March 30, 2012, we received the following good news: :"Kit Kat returned last light. Thank God. I had to use a have a heart trap with a can of tuna. He is very underweight. Will have to take the time to get him healthy again. Thank you , Dennis"
This Persian cat was reported missing on 10/12/2013 in North Franklin, Connecticut and we promptly published an ad on our website. 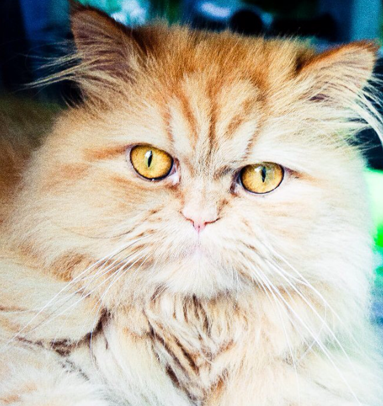 On October 20, 2013, we received the following happy news: “Thank you so much for posting about my cat! Ralphy returned home today (after a week of being missing). We are so happy to have him back! I appreciated your help and advice! 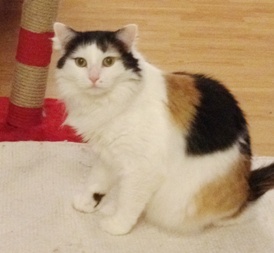 Kalyn "
This cat named Caroline went missing in Groton and an ad was placed on our website on 10/11/2013. A few days later, we received the following joyous email: "Thank you very much for your kind message! We have actually found Coraline! She was hiding in a bush not far away from our doorstep. Thank you for posting and writing, I really appreciated it .Vanessa." "Happy days!! I received a call from someone who had seen one of my posters and they had seen Milli close to where she was lost. We moved the Hav a heart trap to the location the woman identified and I covered the trap with my smelly t shirts (last night at midnight). This morning at 6am Milli was in the trap. Thank you so much for offering to post her missing. I am so glad to have her back! 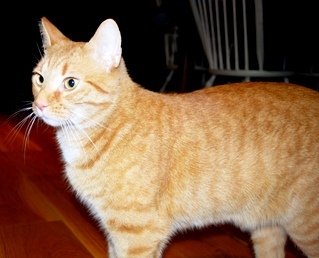 This cat named "Tig"er" was reported to us as missing in Danbury, Connecticut on August 18,2013. On August 29,2013, we received this happy email: "Good Morning – I just wanted to let you know that through an amazing chain of events our cat is HOME! Here’s a quick summary…. 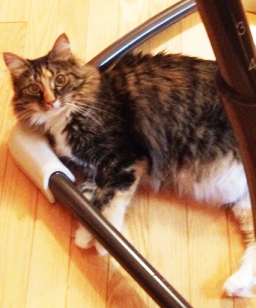 Last night I rec’d a call from a woman whose cat is also missing in the same general area. She was on your website, saw a picture of my cat and thought it could be him. I went to the house last night and within about a minute, Tiger came running out of the woods right to me! Much thinner and clearly exhausted, but now home. He was probably 2/10s of a mile from where he “escaped.” We are so very grateful to you and connecticutcatslostandfound.org website. Thank you.Thank you. Wendy. 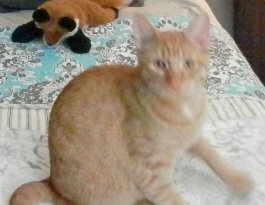 This cat was missing and we received the following email: I would like to post a LOST CAT Female, Orange w/dark orange stripes, petite & slender.One year old, indoor cat, not wearing a collar. She got out on Wednesday evening, August 7, 2013.Woodland Street, Plainville. Thank You. 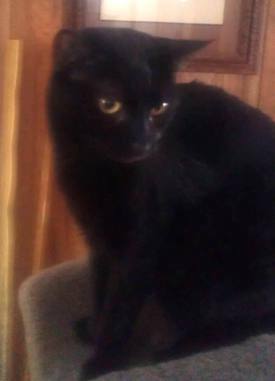 This cat was reported missing to us on July 27, 2013 and the following ad was placed on our website: "Small black cat with yellow eyes missing. Named Squiggles if Found please call anytime day or night (203) ..... Went missing from the Ball Pond area off Illion Road New Fairfield CT Just a couple days later we received this wonderful email: Thank you for posting about my cat Squiggles. She came home around 3:00 pm today. I am grateful for help.Regards,Denise. The following ad was posted on Dec. 5, 2012 for this kitty: "Black male cat found near Haas/Root Rd. in Somers, Connecticut. 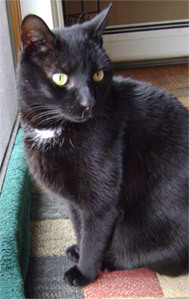 Cat is about 2-3 years old, all black, green eyes, fixed, affectionate and friendly...." Happy reunion occurred. We were notified by email on Dec. 19 2012, which read as follows: " The rightful owner of the young male cat contacted my sister, and the cat is now reunited with his family including a brother cat. The cat's owner did not live far from where he was found, but saw one of the "cat found" posters I made and posted in the neighborhood. Thanks again for posting the ad on your connecticut cats lost and found website." 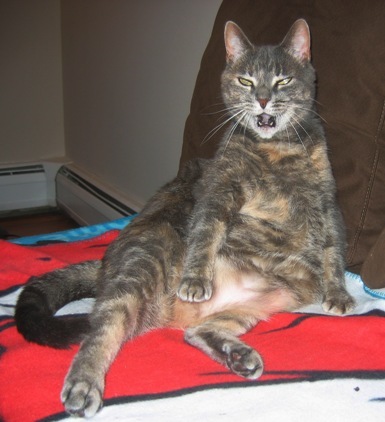 We posted this ad for this kitty "Female cat,Bella missing since 12/8/2012 from Wilton(Cannondale)Danbury Rd.In-door only,shy & not a talker.FIV positive ..."Then on December 12, 2012, we received the following joyful email from her owner: "Hello, Bella is back home safe and sounds! Thanks so much for the support and the tips. It all made me feel less helpless. I ended up contacting the shelter where Bella came from and they set two traps outside my house. Within hours the little rascal was in the trap. I couldn't be happier! Thanks again! 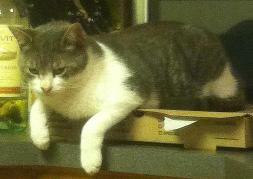 Best, Alba"
This lovely kitty was reported to us as missing from Avon on Sept. 15,2012. On October 1, 2012, we received the following great news from his owner:"I just wanted to let you know that my cat who was lost on Sept15 in Avon, CT is now found!!!!!1! I just brought him home from his rescuer today. He saw a sign I posted in a local vet. I am over the moon and so very grateful.You provide an amazing service and I am so very thankful for your inspiring letter that you sent me. It helped me so much when he was gone. With Thanks,Colleen"
﻿ On September 26, 2012, we posted this ad "Her name is Crystal and she is missing from New Milford at the Rail Road St. area. A day later we received this lovely email: "Thank you for all your help. I am speachless at this moment, at 6:25a.m. she has returned. I saw someone take her, but I guess love come back to where it belongs. 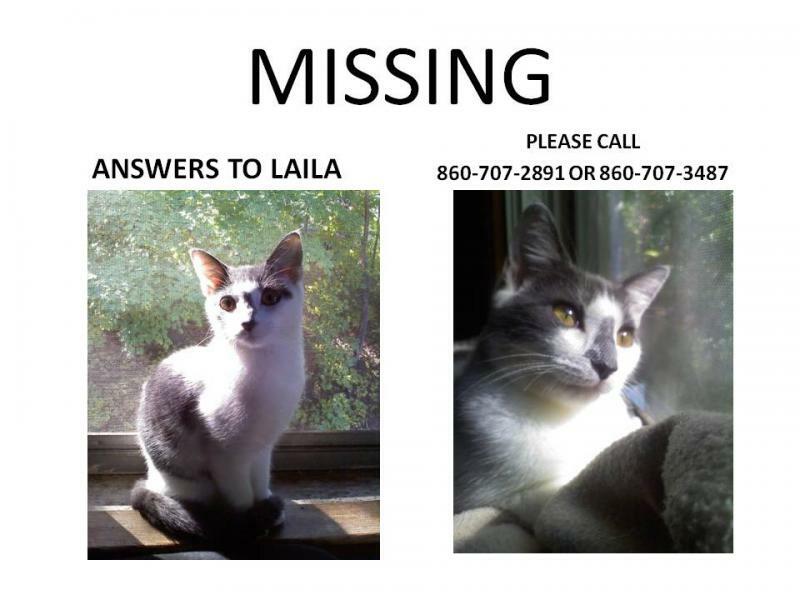 ﻿ Paul"
This cat named Blue was reported to us that she was missing since September 15, 2012 from Lordship, Connecticut. On September 20,2012, we received email with the following great news: I thank you so much. We found our cat today with the help of our neighbors. She was like a mile away. Thanks so much for your help. 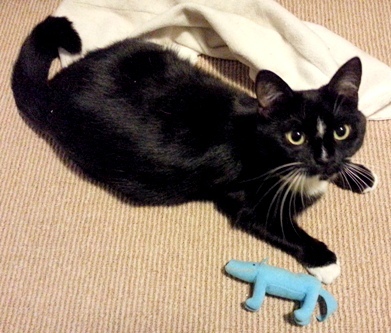 Julie D.
This cat was lost in Waterbury,CT. 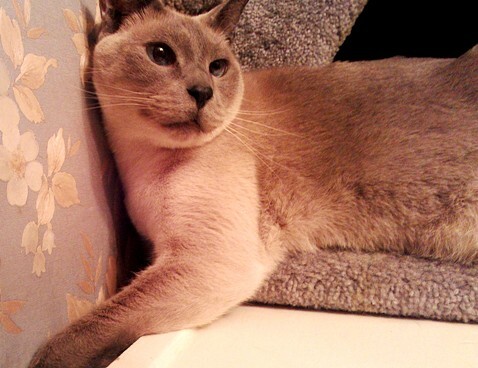 the owner had this ad: "Male,Siamese,blue-point,blue eyes,mostly gray, 12-yr-old,named Newman, missing since 9/15/2012 from Overlook neighborhood specifically on Euclid Ave .A couple of days later we received the following great news: We have found Newman! A neighbor spotted him around her house and he returned safely to our home. Thank you for your help. Desiree. 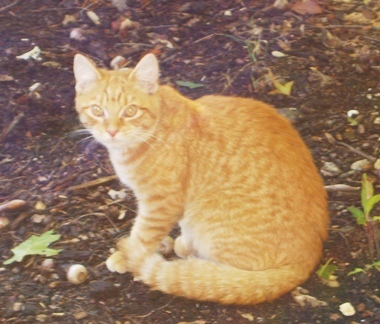 This cat named Benji from Berlin,Connecticut was reported to us as missing on September 15,2012. 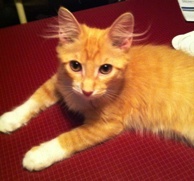 On September 19th, we received the following joyful message: We found our kitty Benji! He was meowing at our neighbor's door and skratching the door window at 2 AM. They are our new neighbors and only saw one of our two cats but not Benji. They called Berlin Animal Control and that's where we found Benji after talking to our neighbor. 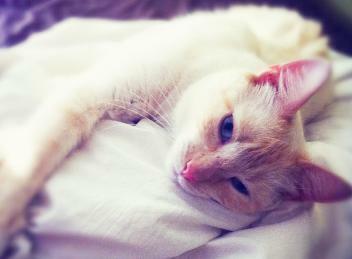 This cat was reported missing to us with the following email:"Nahla went missing 3/12/12. She is a gray tabby with a black streak down her back. She is 7 lbs and very petite and slender and looks like a kitten but she is 2 years old. She was last seen in Norwich, CT... She is immunocompromised and requires regular medical care. She was also recently found to have a heart murmer. If you have any information, please call..." ﻿ Only a couple of days later we received the following great news: "Thank you so much for your prompt posting of Nahla's information. We found her last night. " On October 17, 2011, Jake, this black and white polydactyl cat with yellow eyes was reported missing from West Haven, CT. On November 8, 2011, we received the following great news from his owner: "Wanted to let you know that we have found our cat Jake! He was apparently locked in our neighbor's garage for 9 days. We had our neighbor open the garage the 1st day we were looking for him but he didn't come out. He's fine but thin and is eating a lot. We did take him to the vet who gave him a clean bill of health. Thanks for keeping this website and for all of the tips. Sincerely, Anne"
Cat goes missing from Franklin and returns in five days. 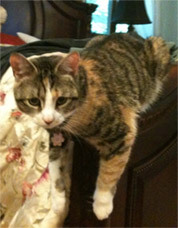 We posted the following ad: "Cat Franklin has been missing in Franklin since 8/28/2011. He's 6 yrs. old,20ls.,black & white with distinctive black mark on nose. Any info, pls. call...On September 2, 2011, we received the following email: Thank so much! Franklin came back this morning! Elizabeth"
New F﻿airfield Cat returns home in a couple of days. 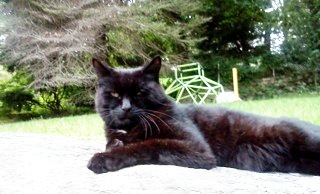 We published the following ad: Black cat w/white spot on breast & under belly missing since 8/30/2011 from New Fairfield.Cat “Billy” has little bump on nose & bald spot under his chin. Cat is 3 yrs.old,indoor/outdoor & somewhat shy..."On Sept.1,2011,we received the following email: Thank you so much for your efforts! I think your website is a wonderful resource and I will definitely pass it along. Billy did come home at about 1 am this morning in one piece, but completely famished. We believe he was stuck in someone's shed or garage. He's cuddled up on his bed right now, and happily full. We are heading out to take down the numerous flyers we put up and let our neighbors know that he's back. Incidentally, one thing that did make me feel better was your success stories; reading through them really gave me hope. We are so thrilled that our kitty is back, and though we hope he is always safe, I would never take away his freedom, as a few suggested we do if he ever came home. He loves his life and I am glad he has the ability to roam his vast kingdom. Thank you again! 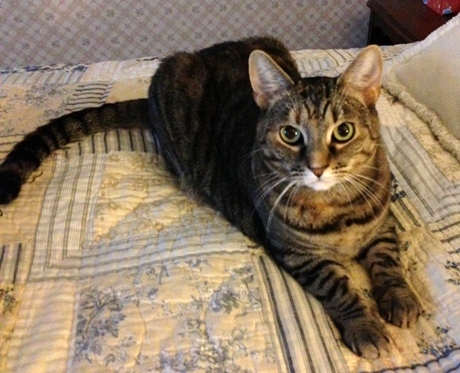 Best wishes, Jess "
On August 18, 2011, we received email from Tara in Brandford, CT that her beloved cat was missing. We later received the following email from her. "Two weeks after losing him and looking everywhere, we found him in a dark dirt hole underneath the house where we had lost him. Thanks for all of your help!" Cat returns home home after a week. We posted this ad: "REWARD: Lost black female cat. 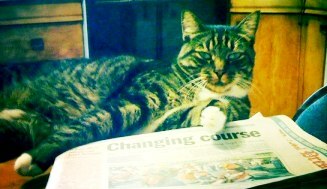 Short haired .Lost in Mystic, CT. Lost on 8/17/2011. We really miss. her. 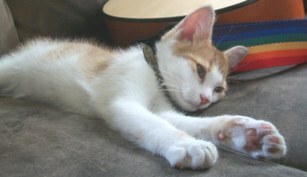 Any info, please call..." On August 23,2011, "we received the following email: OUR CAT CAME HOME TODAY after 6 days!! Thank you so much for your helpful tips (I followed them) and encouragement. Melinda"
After a month of being gone, Milford cat is found. July of 2011, we published this ad" Our female cat Angelica has been missing since Sat.,July 16,2011. She is about 12 yr.s old...We are devasted that she is missing. Please call Christina.." On August 16, 2011, we received the following good news: "I wanted to let you know that our cat Angelica returned home after almost a month of being gone! Some neighborhood kids spotted her a couple of blocks away and contacted my mother, who then went to bring her home. Your website was wonderful resource and I wanted to thank you. 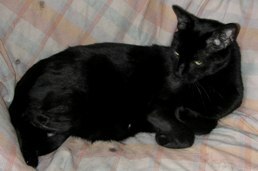 Regards, Chritina"
Lost male black cat in Windsor, owner gets him back. "Black cat has white underbelly, yellow eyes, and white stripe on nose. 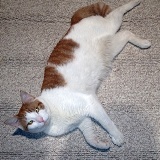 Indoor cat, Two(2) years old and neutered...any info send email to jrshaw@live.com." This was posted on our webstite on July 4 ,2011 and on July 13, 2011. We received the following happy news: "Thanks for you help. I found my cat"